The noble history of Expedition goes way back into the past as far as 2009. I invested around 300 development hours on it, and many times I’ve sit to plan its future… now that Ananias is released it’s time to finish it for good. 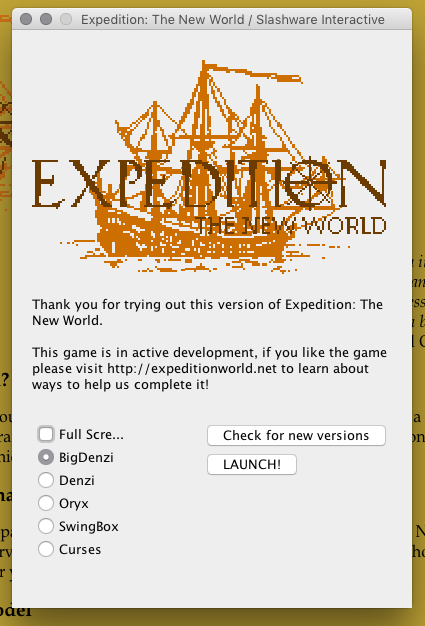 Expedition was the original Slashware Interactive project (I abandoned my day-job to work on it). I was going to be a great indie developer, but then many things happened when I tried to scale the work I had already made into a bigger product with features to appeal more people (I lacked the experience to create a fully working 2D game engine with Java, and back then there were little options). Simple things such as adding tile animations turned into a hell dealing with threading stuff and trying to make Swing behave, and performance was subpar. Not available for mobile devices. Support for music / SFX is limited. Rewriting is always fun and adding the new stuff. Start from scratch, may take around 80 hours to get to the current point. JS weakly typed nature may make maintenance harder. There’s a huge roadmap with lots of features I’ve dreamed. But what will be the best approach to release them as a product? Option 1 – Release a first edition with minimum features. Reduce the feature set to include mainly exploration focused stuff, leaving aside other stuff for the future. Assemble your Expedition in Spain making the best use of limited resources. Survive transatlantic journey to America braving storms and handling your crew. Establish towns to serve as safe places for your Expedition. Explore the new world looking for native civilizations, ruins, natural wonders, exotic plants and animals, obtaining fame to be rewarded on Spain. Trade with natives or conquer them, obtaining goods to sell on Spain. Survive transatlantic journey to Europe. Be rewarded for your journey, prepare for next voyage. Expedition won’t be a graphics intensive game (See issue #3 below). This means it has to be good in other aspects in order to be attractive for people. Releasing an early version without all the features may just not be appealing enough and make Slashware look bad. Autosailing: Follow a direction for a given time or until an event happens. Military buildings: Allow building barracks to train colonists into soldiers, walled fortresses and towers. Road making: Allow creating roads of different quality. Units can move faster over them, mounted units and vehicles get an additional bonus. Mines: Allow finding veins and creating mines, linking them to colonies. Camping: Add expedition fatigue, allow to make camp for the night, and sleep on the ships. Land Vehicles: Add land vehicles you can use to carry more, restricting movement to some terrain types. 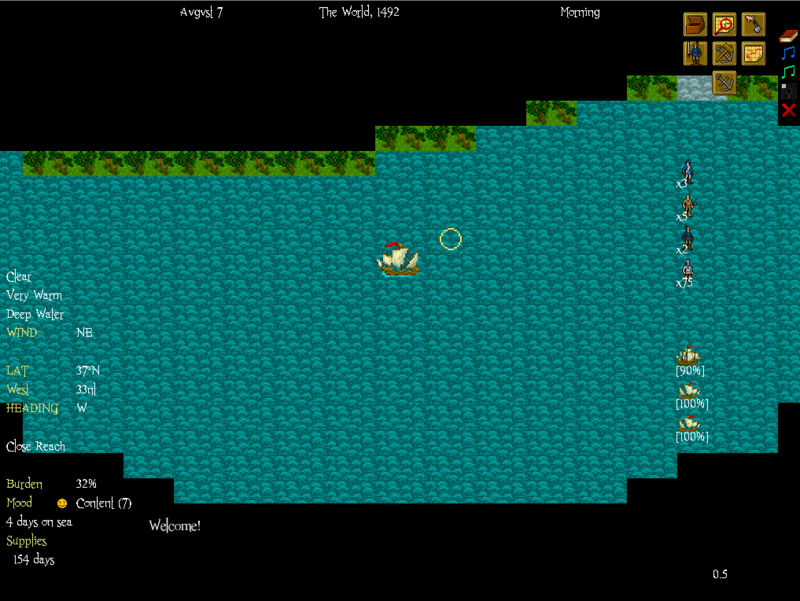 River Exploration: Add rowboats to explore shallow waters. Zoomed in areas: Generate zoomed in areas for mountain passes, caverns and towns, allow zooming into them. More random events that could happen both in the sea or during land expeditions. There are many other things from the original roadmap which I consider just don’t fit a concise vision for the game: To make the player experience being in one of the first European expeditions into the new world, that feeling of being tracing new lines into the world map. This is due to an initial biggest statement of Expedition being a “detailed sandbox of the XV century world”, that’s just too big and may be very hard to turn into a fun experience. Piracy: Be a pirate captain, recruit rogues, steal ships, look for buried treasures, attack cities. Religion: Spread your faith in the land, combat infidels. 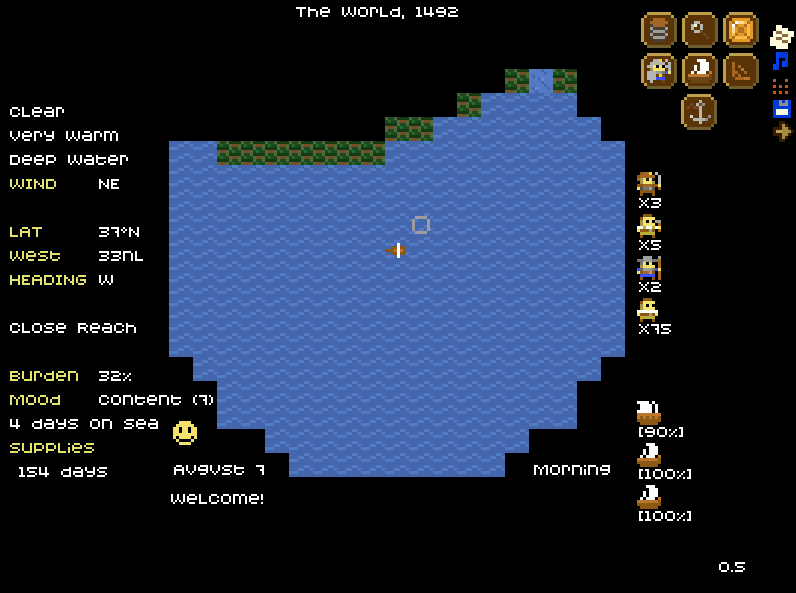 The game currently supports 5 different graphic styles, where the player is left with the choice of which one to use. Should I instead impose a single choice to give the game an unique character and make development easier? SwingBox and Curses are ASCII modes where all output is represented with characters, I think only an extremely minor portion of the players will enjoy and understand it which makes it hard to consider a default choice… but interesting enough, if I were to use them then continuing using Java would be a perfectly valid option. (this was the original output mode, and all complications began when I added graphics over it). They work using libjcsi, a java ascii display lib I did years ago. 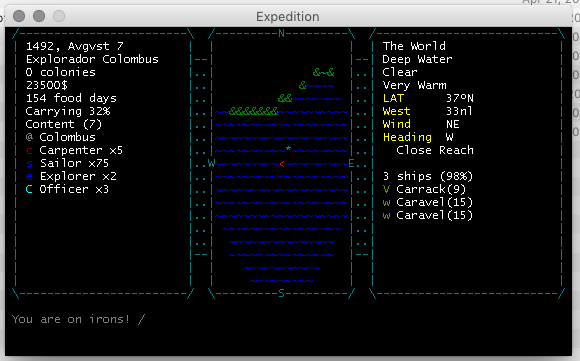 Then we have the modes with actual graphics, there are currently two tilesets for Expedition, a 32×32 tileset made by Denzi and an 8×8 tileset made by Oryx. Denzi tileset is shown 1x in “Denzi” mode and 2x on “Big Denzi” mode (with tiles being distorted as rectangles in order to fit the screen). Oryx tileset is shown 3x. The Oryx tileset should have a familiar style. It’s very iconic and does a great job of providing a graphics representation while not requiring a great production effort for new tiles. I’ve thought on using a slightly modified version of it in order to make it feel a bit more unique. Of course, Denzi tileset is more detailed (specially for the units), however due to the nature of the game engine, the map model and the turn based interaction, the world looks a bit weird on it. May be it would look a bit better with some post processing for the “beaches” to use the corner tiles supplied. May be it’s the color of the sea, I don’t know. I am not sure about the “BigDenzi” mode… On one hand I think the perspective fits more the higher resolution of the characters, but some people have complained about the distortion on the map. I also dislike having two different scales of pixel art shown at the same time (one for the UI, another one for the map). In any case, the font choice for the Denzi modes is absolutely horrible. Of all the graphics mode I think I prefer the Oryx one for it’s symbolic potential and ease of extension in case newer features are added. That’s the current status of things with Expedition… I’m in a bit of a development paralysis pondering these things… if you have any thoughts please let me know, all input is very helpful! Would you play a game with NO ANIMATIONS AT ALL? do you find the basic interaction/gameplay cycle interesting enough? I feel like Tech Option #2 is a no-brainer. If the game will look bad in Java and frustrate you, 80 hours is negligible to get back up to speed. I’m liking the Denzi tiles. They probably would be good with some rounded corners. That should only take a couple hours, honestly. You can do all art tweaking yourself easily. I’m not a big fan of having multiple art styles and having less time to polish each one. My only concern with this game is… what’s the market for Expedition? It’s kind of an odd mashup of genres. I hope you get a lot of feedback on this post, but if not it might be worthwhile to validate the idea through something like Greenlight or Kickstarter before dumping too much time into it. Unless finishing it will be personally satisfying either way, then go for it.